We're moving to Italy when we manage to sell our place here. My 5500s are pretty old Mk1s; I'm guessing they must be 15+ years old. I've never had any issues with them and they still look like new, but how long might I reasonably expect them to last? They typically get about 30 hours use each week and are usually run with volumes between high 50s and mid 80s. The reason for asking is that if anything major went wrong with them then shipping them back & forth would presumably make it uneconomic, even though there is a dealer in Italy. There was a recent thread about 200 CD transports and most appear to have died. I'd expect speakers to outlive CD players, but does anyone have a take on average life expectancy? I bought my D600s in 1989. I had a (cheap) component replaced. They work fine but haven't been overused. My 7ks must be nearly 10 years old. Used pretty much every day. Two major international moves, with one voltage change. Never a problem. I don't think I'd worry about DSPs, they are not the same as the players with transport mechanisms, or the G/800 series with switched mode powers supplies. My own opinion (and expectation) is that these work horses will still be going strong after 25 or 30 years, with only driver replacements (ie tweeters) needed very occasionally along the way. There was a comment attributed to Meridian staff (St Des or Dave Hall IIRC) here some years ago about the DSPs being very, very reliable. You should rarely have to ship the cabinet for repair. It's either a bad driver, which you can usually fix and diagnose yourself. Or the electronics and you can often just ship the back in. Only thing that might fail that would require shipping cabinet is the display, but that is fairly rare. 5500's are still running very strong. These puppies were built well, and although they do require periodic maintenance, they do have a better record for longevity and reliability than the 5k's. In due time, the back panel electronics will likely have a heat related issue such as a burnt up load resistor or dried up capacitors. These are easy fixes and can be done without the cabinet. Take them with you and enjoy without worry. You have some great speakers. 5K's I think are built just as well and have just as good a track record. All DSP Speakers have pretty good track records. I have 10 5K's and not a failure yet. Some are 15 years old. Where I did have minor failures on much newer 5500's. Please trust that I KNOW, the difference in failure between the two, intimately. 5500 are and remain more reliable. Every pair of 5k's experience the same fault in due time. If you are interested in ever repairing your failed 5k's (when they fail) let me know. I can also help you to prevent that failure if you are interested. Make that 22 between George and Hector. My first pair are 16 years old and never a failure not even a tweeter. The only degradation/failure in all this time is my ears. I can also help you to prevent that failure if you are interested. Have to ask, can you tell us a bit more? Sure, I'd love to know. Post it PM it or even better add it to the Wiki. I'm sure others would love to know too. I know they will all fail eventually. But I've had very good luck with the 5K's (so far). Lot of bang for the buck. Odd comments re the failure rate of 5Ks. I have never seen then fail at any faster rate than the other speakers. There have been more failures of 5 Ks than 5500s but I would attribute that to the fact that there are so many more pairs of 5Ks than 5500s. I don't have the records anymore but would guess from experience that the actual failure rate is approx the same. Also not any inherent flaw in the 5Ks over the 5500s. They are very similar in design and production. If instructions were simple, it would be appreciated if these could be posted. But if they are not, in light of potential component shortages, is prevention now better than trying the cure later if/when the failed bits are no longer available? This work done in a preventive measure, will require less tedious soldering and possibly trace/run repairs. I would like to eventually post some pictures and tutorial, but as of now, I'll simply supply in text. As long as this is done in prevention and the dreaded "hot" is not apparent or the unit has not completely stopped passing audio, this should not take longer than 45 minutes. You will replace the existing load resistor with new. If you have wire wound resistor in place, purchase the nomenclature specified on the device, or use the mentioned 680 ohm. It doesn't matter which is used. Remove the seven outermost screws holding the back panel electronics to the cabinet. The power supply can stay put unless you wish to pull it as well. Once the power cable is removed, remove the flex cabling from the silver tin can that connects to the display. (****you will see a red line on the cable***be sure to note its orientation or you will not have lights***again, it is not idiot proof and can go on either way. Now that the back panel is free, set it in a well lit area. You will notice the amp section in the center, and a tin can to the right. Between the amps and this tin, and the edge of the pcb, you will find to load resistors standing vertical. These are to the left of a blue and black mute wire section. They will be located near a two voltage regulators and varying caps. Again, you may recognise either load resistors or wire wound type. They should show signs of heat and look rather "used". If they look BURNT, you may encounter some difficulty in removal. Remove the corresponding screws that hold the tin can to the back panel. This depends on the rev how many there are, but this will allow more play on the wires coming from underneath to the amps. 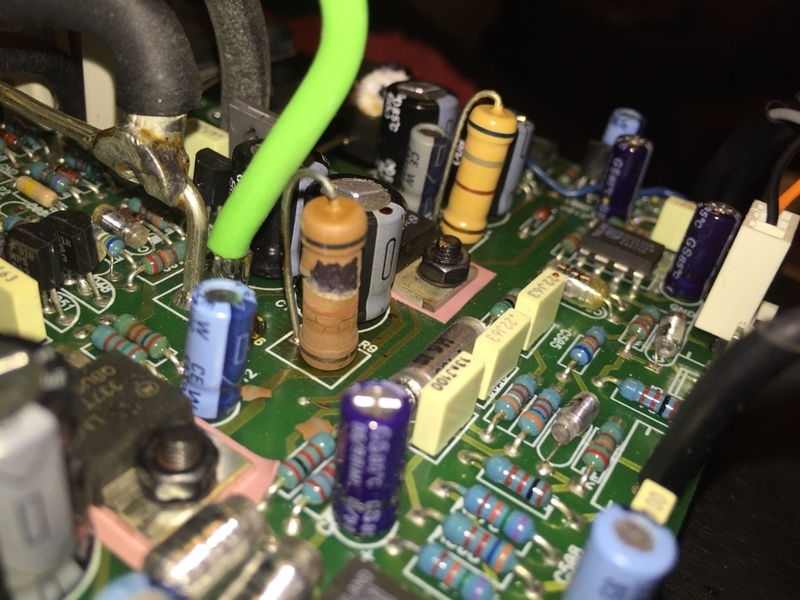 Once you have the DSP board visible from under the can, you can check for popped caps or raised cap lids on the caps located on the DSP board. Raised caps are indicators of failure or failing. Your unit may be working with these, but this shows they need to be changed. This part is jsut visual inspection at this point. Flip the back panel over or stand it tall and remove the Three screws in the center of the electronics that correspond to the amp section. this will allow you to lift the board up and check the underside. You will want to check the lines/traces/runs that connect the eyelets for the mentioned load resistors. If they look badly burnt, you have difficulty removing the solder and eyelet will be damaged. I suggest adding a little new solder to the eyelet for each resistor on the top side for a good re-flow. I suggest using wicking to remove the solder from the bottom side. Do not attempt to remove the resistors without removing the solder or until they will come freely out without the soldering iron. Be careful not to use too much heat either as it will cause the trace runs to lift. Once both have been removed, insert new resistors(orientation on a resistor is not important- no polarity). Solder from top or bottom until there is uniform flow with the rest of the board. Visually inspect the surround caps for lifting or popping tops. In most general cases, nothing else should be needed in the preventive stage. The load resistors generally cause the faults. The surrounding voltage regulators 2x 337 and 317 have been known to defect, but again, probably wont need replacing in prevent. 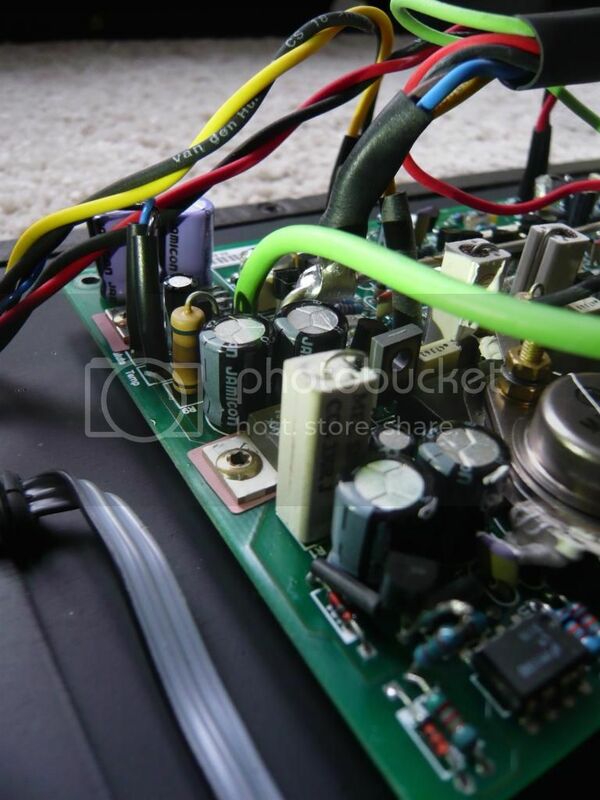 If there aren't any sound anomalies, there shouldn't be any reason to measure components on the amp side. The amp generally either works...or it doesn't, and in most cases rarely ever needs repair. Assembly is easy enough. Place the three amp screws back into the back panel. Place the tin back atop the DSP board and make sure all wires are routed without pinching. Place the back panel atop the power supply and attach the molex in the correct noted direction, plug in the umbilical to the cabinet from the amps, and then connect the display cable with the red wires in the noted orientation. Place 2-3 screw in the back panel and test power for lights and then audio. If no lights, you have the display cable on wrong. If no audio, you forgot to plug in the umbilical . If the power pops and sparks and scares you brown in the pants, you hooked the psu up improperly and did not note the correct orientation. This is not a difficult task and can be done in no more than 30-45 minutes. If you have questions, feel free to PM and send pictures as well. At what age do these tend to fail? Or at what age could they start to fail? I always cut the part out first. Then heat the lead from the back side and pull it out from the component side with needle nose. Then I use a solder sucker on the component side and heat on the back to clean it. Thanks Marc. I wondered if the statistics was a factor as well. This forum has been up for 12 years and I don't recall seeing any DSP speaker stand out from the crowd on failures (even with those statistics). Expect perhaps DSP-33's occasionally (possibly again because I think Meridian sold a lot of those). The most common failure (on the forum) is the Tweeter. 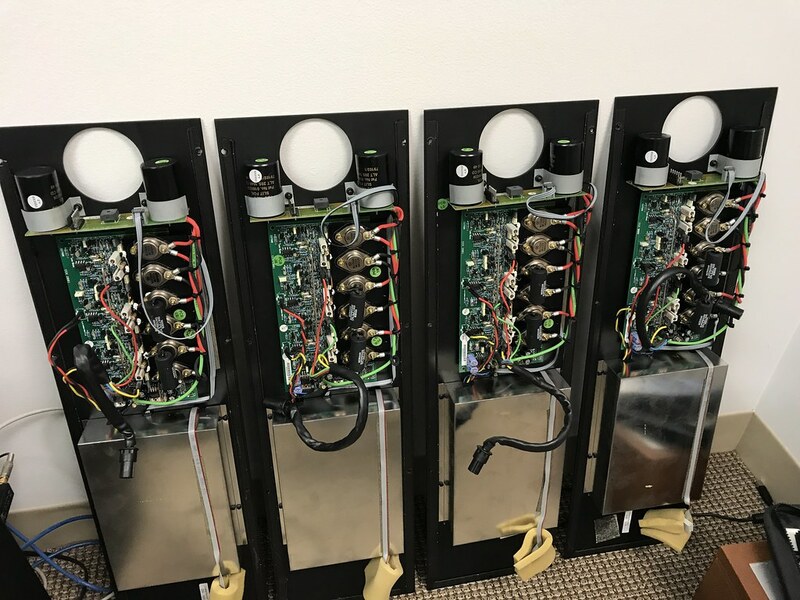 A few cases of transformer hum. Occasionally D1 input goes while D2 still works (probably due to user error). Overall a pretty good track record (on the forum) if you consider it includes multiple amps, DAC and the speaker. And they are very serviceable. Can one really tell? I have often wondered about this. While I think actual failure of the woofer/driver/amp is immediately obvious -- what of the parts that slowly decay/degrade with time? I know caps can degrade, what else is in there that just slowly degrades with time? I guess the real question is. If I took a 10 year old 5000 and one that was brand new, would it sound the same? I don't know the answer. Primary: MD600, MS200 (SpeakerLink to AES), Trinnov ST-2, Ayre V6-xe, Salk SS8 3x LRC. Zone one: 568.2, G57, MS200, Spatial Hologram M2SE. George, you must live in an enormous domicile! But they are not in one place, 3 addresses actually. 2 spares in boxes since I have such a large dependence on them. Most of them were around $1000.00 a pair. 3 sets are hooked to TASCAM US-144mkII Preamp ($130.00) off a computer. 2 pairs are 24/96 but I notice zero difference with that. Room/Placement impacts their performance way more. It just happens the older 18-bit ones sound the best by no small margin because of room/placement. Occasionally D1 input goes while D2 still works (probably due to user error). The D1-D2 issue is a hex inverter on the DSP board. This is the second most likely fault with the 5K after the load resistors. I can't say at what age or usage the load resistors fail. Anywhere from serials 100-400...It's not uncommon. A quick visual inspection can tell you whether it is time or not. Big house, George, big house! Actually I thought maybe you'd secretly reformatted your G68 to produce 12 discreet channels!!! 861v6, HD621, DSP5200, DSP5500HC, DSP33, ROKU3, Transporter, VP50Pro, Pioneer 6010, Pronto TSU/RFX9600. Fidler; you could sell your 10 DSP5000s and treat yourself to a new fiddle!! Excuse me for digging this up from the past, but just couple of points in the interests of future readers, it being a wiki entry. 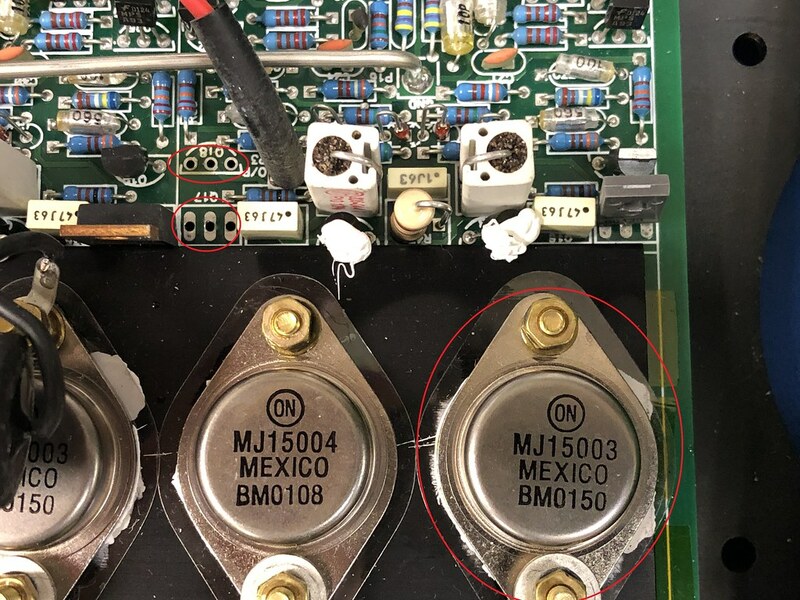 In the wiki, it says two 680 ohm resistors but looking at an earlier 5k amp board, it looks like there's one 680 ohm and one 330 ohm. The replacement suggested in the wiki is a "typical" resistor, whereas earlier 5ks has wire wound ceramic types. A smiley face 5k seems to have a "typical" resistor but it doesn't look like 680 to my untrained eye. The ceramic is 4W and suggested replacement looks like 2. Any comments from the EEs out there (apart from get an expert to do it...)? Edited by Tintin; 2014-10-30 19:28. Was the 330ohm used in front of the negative regulator? In my M60's (different PCB layout) the drop across resistor R9 is about 33V. The drop across R1, which feeds the positive regulator is about 21V. R9 gets pretty damn hot, and my three M60's had overheated R9 resistors (crispy!) and burnt PCB spots under R9. Around R1 gets warm, but not like R9. I suspect your 330ohm resistor was used in later models using similar regulator circuits to my M60's to adjust the voltage divider created by R9 and the rest of the negative regulated circuit. The 330ohm resistor seems to shift more volt drop to the regulator and the rest of the negative regulated circuit. Apparently, the regulators and/or the rest of both regulated circuits have different impedances that were not correctly accounted for. Using 680ohms for both R1 and R9 makes R9 run very hot. Just about to embark on preventative maintenance of the resistors. According to the schematics, R1 is in front of the +ve regulator and R9 the -ve regulator. The schematics have also been updated by being written on to show R1 as 330R and R9 as 680R as per the first picture in TinTin's post. I currently have both R1 and R9 as 680R, should I change to be as per the schematics? Is anyone able to answer the question in the previous post ? I didn't want to risk making an expensive mistake so I replaced like for like. When I opened them up I had two 680 ohm resistors (R1 and R9) so put the same back in, however I did increase the rating to 5W. As the speakers were manufactured in 1994 (I think), I would be happy if the resistors lasted another 23 years. Both of the resistors in both of the speakers were crumbling so I would recommend everyone with a speaker of similar age to at least check the resistors. You may save a larger repair bill if you catch them before they fail. Tarik, thanks for the informative reply. Much appreciated. I just checked and I did change R9 to 330ohms so it runs cooler. This shifts some power to the regulator, which is not a big deal since it's bolted to a large pad. Just in case I glued small heat sinks to the regulators and R1 and R9. I changed all electros to Panasonic FRs, except electros in the signal path, which I changed to a higher end film type that I can't remember. There was an improvement in sound, which makes sense. A lot of the removed caps were obviously brown (especially around R9) and tested to only a fraction of their rated capacity. Sounds like you are all good to go! Nice work on the DIY recap. Edited by RobinASU; 2017-09-15 05:39. 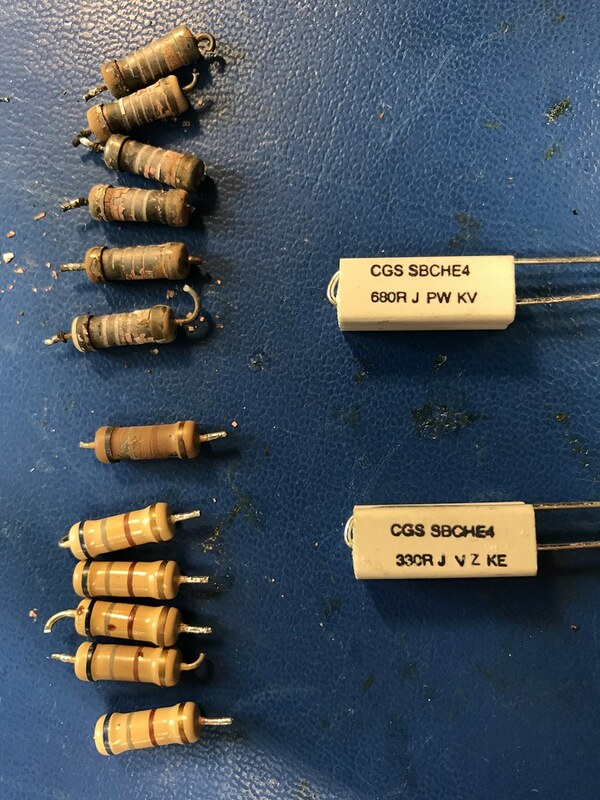 I was swapping "Cabinets" with a friend (rose for cherry) and inspected the infamous resistors and they were cooked on both 24/96 sets (all 4 24/96 backs). I also recently bought another smiley pair and inspected one of them and took pictures for reference and they looked great. 1 "Smiley" 300xxx S/N 1 is a 330 Ceramic the other not Ceramic. I also have another ancient 18bit pair and those look great also (only one). 100xxx S/N both non ceramic. They are both 680's. So we were trying to figure what is the best resistors to use. He is a very experienced EE guy. Between us we have about 16 DSP5000's and we plan to do this maintenance to most of them. For grins I pulled up the photo of most recent pair that looked good and noticed that in ADDITION to the 330 Ceramic. There is another Mod that was done in that area. Take a look at the photo below. There was mention of schematics (old and new). Could someone PM/Email me those schematics. Also just lowering the 680 to 330 could RAISE the heat the resistor has to dissipate not lower it. The 330 might need the rest of the mod. I'll check exact serial numbers to double check what is newer than what. Also this voltage regulation does NOT feed the digital board. You have a lot of work ahead of you! 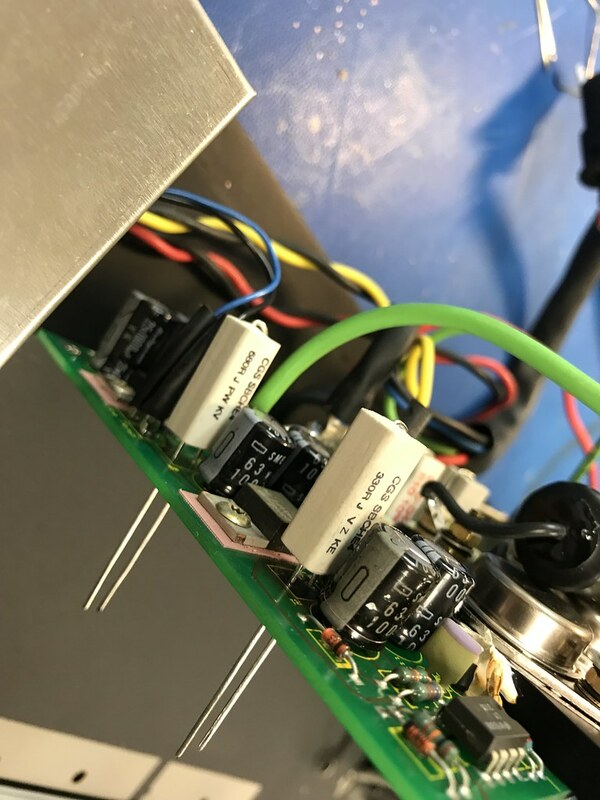 On my M60s the overheated resistors from the power rails to the regulator power input create a voltage divider with the regulator and dissipate some of the power the regulator would normally take. The regulator pulls constant current to feed the connected circuit, so when you reduce the value of those resistors the power dissipated by them is reduced and added to the regulator. On all three of my M60s the negative regulators had a lower drop across them than the positive regulators. They are different parts. Lowering the value to 330ohms shifted power to the negative regulator. My PCBs were toasted and I didn’t want that to deal with resurrecting them again. I recommend replacing with the same value you have at a higher power rating. It will still get too hot, but should last at least another 10 years assuming your PCB is in good shape. If not good shape, you might want to consider 330ohms. Obviously, you should check voltages before and after and understand what you are doing before you do it. These were all hand made boards and there seems to be some variation in design and parts used, but they seem similar. Also, if those black caps are a different brand than the light blue caps, maybe somebody was there before you. The trace on the bottom of the PCB my have burned up, requiring a jumper. I would replace all those electos. Most of the original ones around the regulators will test at a fraction of their rated value. I don’t think it was repaired. There is an ADDed transistor there !! I plan to open it’s sister to see if it has the same mod. Looks like a factory change from new to me. By the way the S/N is 306245 in the photo above. Transistor? Huh. That sounds custom. ha. That transistor is in 4 different DSP5000's bought from 2 places. One pair bought new direct from Meridian. I just checked another pair, S/N 305805 and it has the MOD too. This photo shows the part number on the transistor. It's the small black transistor. I didn't embed picture so you get the full resolution of original. Interesting. If you find or make a diagram let us know. I would replace the resistors with ones of the same value but a higher rating. The ceramics will be ok. I used Kiwame 5W which are available in both 680R and 330R. The leads also fit through the holes in the board. Look out for lifting tracks and repair these at the same time. Also while you have got the amp board off, replace the caps (electrolytic + 4 supersounds) as well. Not much additional cost or effort but well worth it. The modification in your picture looks to be around the thermal shutdown circuit and not related to the power supply. Email sent to the address in your profile. I think we found the same Resistors Meridian uses (at least the same package). I believe they are 4 Watt Wire Wound in a Ceramic Case. I found them at Newark.Com (from UK Warehouse), DigiKey.com has one but not both in stock. We also measured the Voltage going into the Regulator in Standby and Not Loaded. With 680 Ohm it's like 33 Volts. With 330 Ohm it's like 39 Volts. The output, which is what matters was 15V in either case. The regulator Max Input Spec is 37. In case anyone hasn't seen what this looks like. Awesome work and great to have the photos on the site. I replaced them on my smiley 5000s and was surprised by the range of 'burning' on those resistors. One pair was pretty bad, the other not so bad. I have an old pair of 18-bitters that are pushing 30 years old and those resistors still look great. I wonder why the resistors on the 24/96 seem to go bad faster? We are also wondering why the 18bit ones don’t fail. Mine look perfect too. Has anyone replaced the amps in the 5000s? Any suggestion for replacement parts? Do you mean replace a faulty amp with like for like, or remove and replace with some sort of upgrade/different manufacturer? But would also be open to suggestions for alternate options. Like for like is straight forward. Probably take no more than 30 mins. 6 small wires from the DSP board soldered to PCB pins on the amp, so easy to remove. Just slide back the heat shrink on each carefully. 5 cables going to the rectifier board with the two large capacitors. Slight harder but with a suitable soldering iron should be no problem, just more area to heat up. 3 screws holding the heat sink to the panel. We've done about 10 out of 15 speakers so far. Took 10 days before they even shipped the part out. If your speakers are 24/96 with older 7 Segment Display I can almost guarantee your resistor is toast and the board damaged. Some Matrix Display units (later ones) have the 330 Ohm 4 Watt and some don't (earlier ones). 4 of mine had the 330 Ohm 4 watt and looked perfect and 4 looked just like the 7 segment display models (i.e. toasted). Every one with "brown" resistor had damage to the board. And getting the toast ones out was not easy with out further damage, due to warping and swelling of the board in that area. The two 18 bit I have left also looked good, but that was a small sample. I mounted them a bit above the board so as not to use the board as a "heat sink" any more. All of them needed rework like this. Some needed rework on both. Really helpful stuff George, great photos. Many thanks. New resistors look to be very close to capacitors - maybe arrange bigger gap? Also 4 watts is quite a lot of heat to dissipate for the small resistor area, a small metal heatsink might be useful. 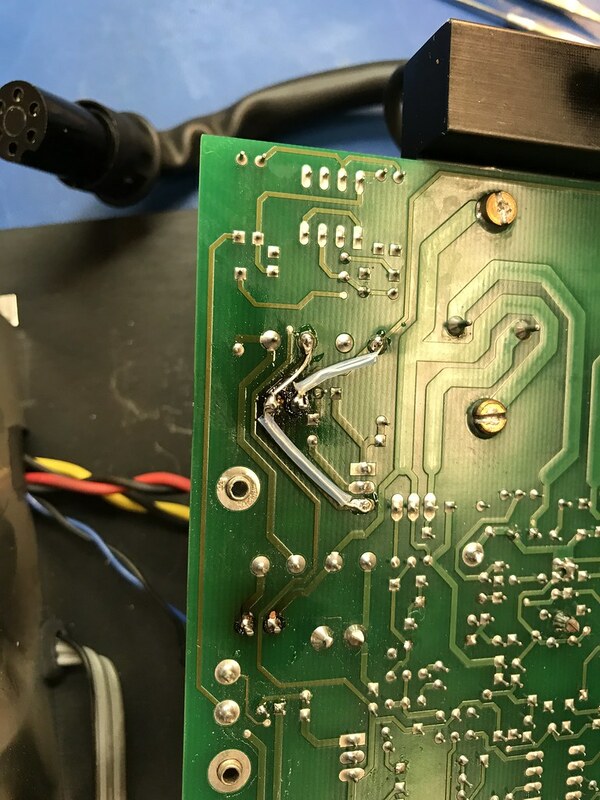 Was also looking at thread about G95 failure, and wondering if surface mount components are a good thing from customers point of view. Having everything repairable would be my ideal, and the thuoght of some DSP8k's becomoing un-repairable for want of a chip, say, is worrying. The resistors can withstand 4 watts, doesn’t mean they will have to dissipate that much. We did what Meridian did with the latest version, which seem to hold up fine. The larger wattage resistor will have way more surface area to dissipate half the wattage. We plan to measure temps. Ran Pink Noise 1 Hour at 65 Level with Speaker Closed up. Measured 12V Across the Resistor that Cooks (Negative Side of the 45V). Both the Regulator and Resistor were around 137F (close to 60C). That does not explain the Temps/Conditions needed to Burn Resistor and the Board. But it was still climbing slowly after 1 hr (and it climbed slowly the whole time). Room was fairly cool. Oh my friend found conflicting info in the Data sheets that the regulator is limited to an absolute 37V input vs it's limited to 37V difference between input and output. If it was absolute spec the 330 ohm raises the voltage and puts the input slightly out of spec (39V). With relative spec it's (39V input - 15V output) which is well within spec. How easy is it to view the offending resisters? Im thinking of selling my 5k's and don't want to do so without checking the condition of the resisters and replacing/discounting if necessary - would rather someone else did any replacement but looks like in UK options to repair legacy kit is getting limited. Before I purchased these, the person that I purchased from said that they were serviced by a dealer so hoping that they are all good. It is quite straight forward to check the resistors. 5) If you want to take a closer look the three leads mentioned above will need to be disconnected. This won't tell you the condition of the PCB underneath but will give you an idea. You shouldn't need anyone specialized in "Meridian" to do the repair. Any competent repair shop should be able to handle it. If the resistors are not brown, I suspect your PCB board is fine. 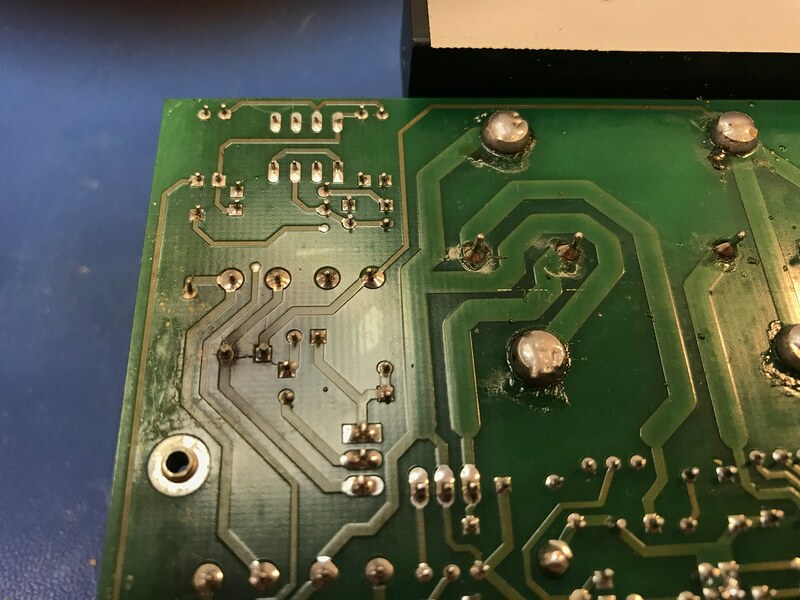 Even with burned Resistors the PCB was often fine, it's the process of removing them that does the most damage to the PCB traces. "Sometimes" you can cut off the lead wires and with a 0.5mm drill in a little chuck, drill out the remainder of the lead from the board. Just to clarify further I use a pin chuck and rotate drill bit by hand. We used a hand drill AFTER we removed the lead. We cut the resistor at top first. We had a "power" Solder Sucker but it was designed for more modern boards that can take heat better. It was kind of mixed results using it. The non burned resistors came out easy. But the burned ones the solder didn't melt or conduct heat very well. If you leave the lead in and try to drill I think it would be very easy to drift away from the center because the lead would be lot harder than the material around it, which is mostly PCB board. We did 30 Resistors !! Here is an image of the bottom BEFORE we touched it. Not good. Looks like mine used to. You guys have been busy. It's amazing what long-term heat degradation can do. How did you wind up with such a large collection of speakers? The drill can wander, which is why I said "sometimes" for exactly the reason you state. That wasn’t even all of them some didn’t need repair. For the stubborn joints did you try adding a little flux and then adding solder to the joint? After that add a bit more flux before de-soldering. Yes, did that on all of them. It still didn’t flow/mix well on the burned ones. Still lots of resistance pulling out the burned ones. The non burned ones practically fell out as soon as we touched it with the iron. Traces were no longer adhered to the board. Great thread and thanks for posting those photos. Any other DSPs need maintenance like the resistors on the 5000s? I also have 5500s and 6000s, but never opened them up. Thankfully, they have been working well so far, so no need to. The 5500s are almost 20 years old at this point. The 6000s are probably even older. Not sure about the other DSPs, but M60s share the same resistor problem so should be checked. Also to state the obvious, centre speakers will be affected as well. We did 2 centers. Both cooked. Is this problem isolated to the DSP5000 speaker or is the 5200-series also affected? DSP5200 Legacy, G68ADV, Surround: Audiovector K-X, SUB: DIY Peerless XLS 10" with 10" slave. It’s not a problem above a certain serial number on DSP5000 and was directly addressed. That is the change I put in. So I very much doubt this problem exists on anything newer. I can’t speak for similar generation 5500’s and 6000’s though. I just re-read this thread and there is a quite a few statements that are wrong. 1) Not all DSP5000 will fail. Above S/N 305805, no worries. No evidence of 18bit having the issue either. 2) In all cases (15) the Resistor DID NOT FAIL. They are not cooking because the resistor is failing. They are cooking because there is too much wattage going through that resistor. That heat will shorten the life of the resistor, but more likely damage the nearby Capacitor(s) or the board. 3) I highly recommend NOT replacing Like for Like. You'll have the same heat problem if you do, even with higher wattage resistor, the heat will still be a problem. Meridian's fix lowers the wattage through the resistor and uses a HUGE 4W resistor to dissipate that heat better over a much larger space. Not so much to prevent that resistor from failing itself but to make that resistor run cooler. Also DSP5000 is no more prone to D1 or D2 failure than any other DSP speaker of that vintage. if you don't let your newer gen DSPs overheat (cool room temps), then they will NOT fail for decades. Here are some pictures of my M60 repair (very similar analog amp to the DSP5000). It appeared things were on their last legs on both speakers. Crispy! 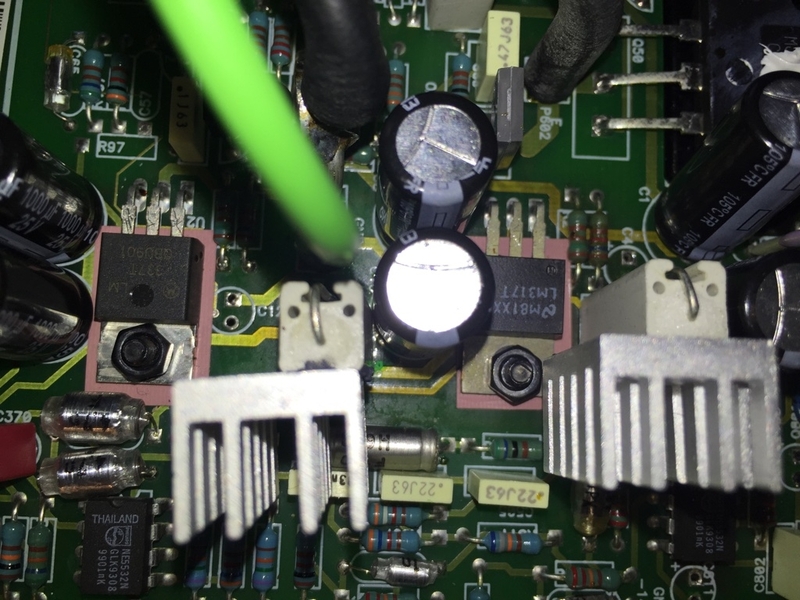 Speaker 1: The resistor between the positive regulator and positive power rail was in very good shape. 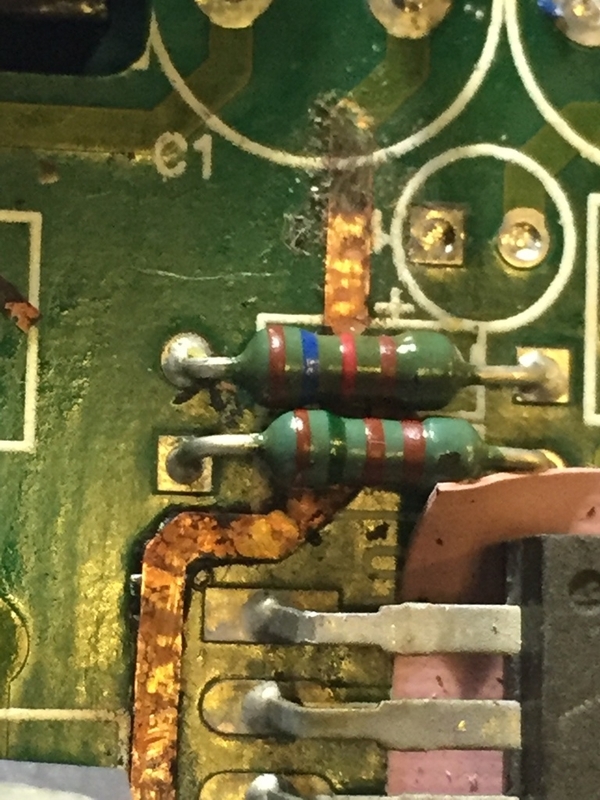 The pads under the crispy resistors were barely connected and the PCB was black carbon. That area had to be completely cleaned and fixed with epoxy. Hot! Speaker 2: Looks like the current was high or things got hot for an extended amount of time. This was also repaired with epoxy. The lead time for 330R's was way too long so I made them- also added some heat sinks and my version of radiation shielding. I've got a defective DSP5000 (24/96) and a working DSP5000C (24/96). From what I've learned from this thread - the audio sections are interchangeable - is this also true of the digital section? IOW-can I just transplant the gutz and drive away happy? Assuming I don't find the classic blown fuse or bass-bass/mid drivers blown - just transplant electronics? What is wrong with the DSP5000? Yes you can transplant from a centre but you would need to load the appropriate firmware after the operation. Obviously only do this if you are both confident and competent as you could end up with two bricks! Man, this thread makes me kinda nervous for my DSP5000C "smiley" center. I run it pretty heavily with Trifield and its serialnumber seems to match up with the problematic units. Last time I tried opening it i just couldnt get the back panel off at all even with all the screws out. seemed like it got stuck from sitting all these years. I should probably give it another go to make sure everything is okay in there. They will stick a bit. Give it a gentle pry and it should open up. I have had several sets of 5ks both 18 bit and 96/24 factory conversions and smiley face . My experience has been very positive with all all of these. Tarik-the issue with the 5000 24/96 is it won't take programing from the remote -some sound comes out of the tweeter ? In terms of loading firmware - do you mean the initial defining whether Master or slave -tellin the speaker if it's left or right ? 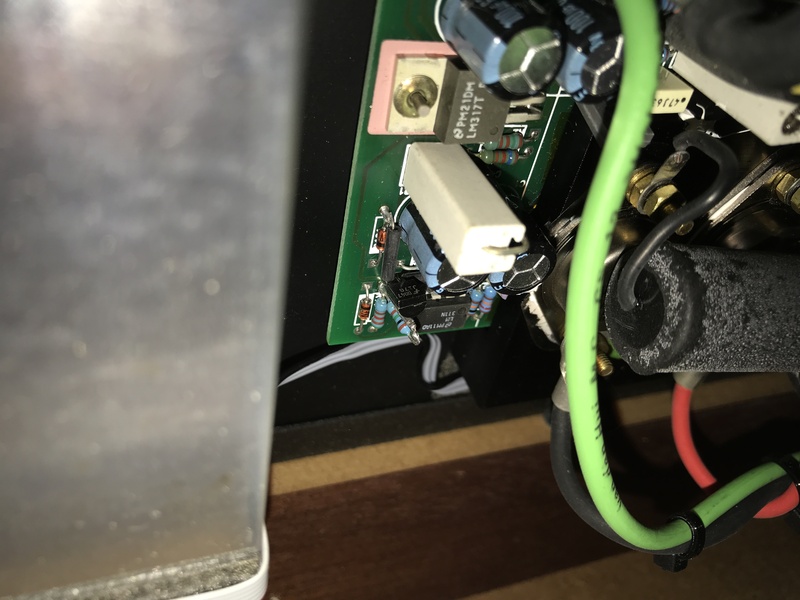 I have not started to troubleshoot this speaker yet-if the issue is with the IR receiver -guess I'll have to re-think this a bit ? Do you mean it won't respond to commands from the remote such as changing volume? Did it ever work and have you tried re-typing/configuring? Can you describe the noise that comes from the tweeter or upload an audio clip somewhere and link here. The firmware is what makes the speaker work. It is loaded from a PC via RS232 into each speaker. The latest is v5.21. What you are referring to is typing and configuration which is different from the firmware. I bought 6 DSP5000 96/24's, a center and a sub. 5 of the 6 5000's work fine - I'm really enjoying a stereo pair and have loaned the other pair to a buddy. The questionable 5000 does not accept retyping (I've tried a couple of times) - I hear music faintly out of the tweeter when hooked up into D1 (SPDIF from CD). Why would the amplifiers need to have new firmware - not saying you're wrong about this - just wonder why new firmware is required? A DSP speaker comprises a DSP/Com board which accepts the signal and does all the work such as working out what to do with the IR commands and also performs the DSP functions such as the crossover in the digital domain. This signal is then fed to the amps. The firmware is what controls the DSP/Com board. I would try uploading the firmware again to see if that helps. Unfortunately if the DSP/Com board is toast you will struggle to find them anymore. I would suggest this is where the problem lies if the speaker is not responding. Worth checking you have selected CD on the MSR before trying to re type speakers. 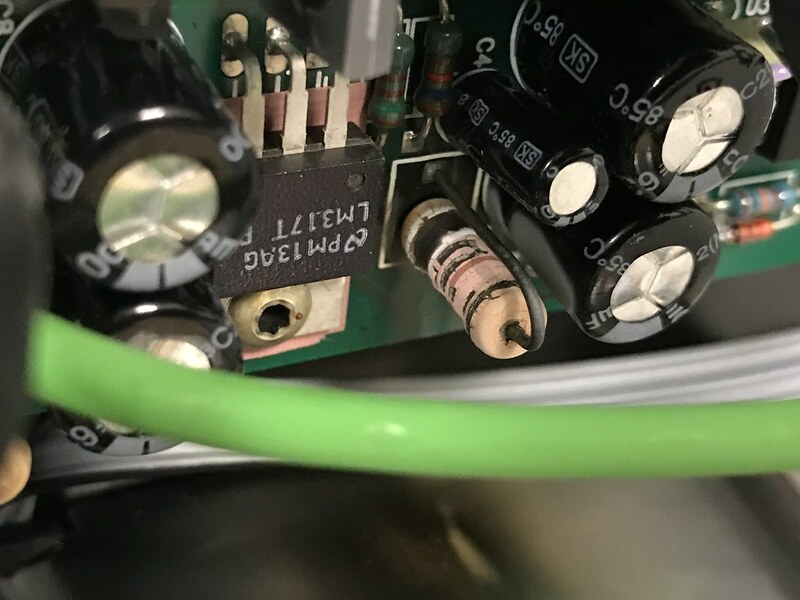 If you blow a DSP 5000 Amp Channel, chances are these are what blew. This happened twice to me. But is probably caused by powering up speaker when it's too cold, both times. All 3 transistors in red circles are dead shorts. Note there are 6 sets of these 3 transistors. 3 of one type and 3 of another. Same set failed both times (but different channel this time). My original fix with parts below has held up for 10 years and still working. Keep in mind this image is a link. Download for safe keeping. The parts were ordered from https://www.mouser.com/ 10 years ago. Luckily I had ordered one spare set, hopefully I can find them. These part numbers might not be valid today. Edited by Fiddler; 2019-03-25 16:25. To my surprise when I had gone through 15 DSP 5000's a year ago or so and posted about earlier in this thread, I had checked ONE of my newest DSP 5000 (Smiley) and it already had the more vulnerable 330 Ohm resistor with the high 4W style installed and the 680 Ohm was the lower watt (1 W?) style. But it was sparkling shiny. So I did not replace the resistors or bother to check the sister speaker. 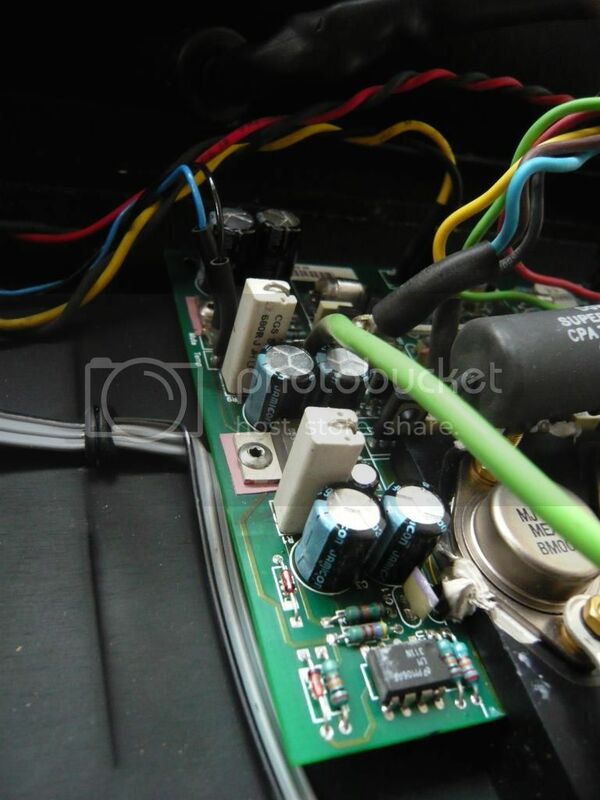 When I went to open my blown DSP 5000 I was shocked to see the 680 Ohm Resistor really cooked. It was not the cause of the failure but definitely needed to be replaced. It was so badly cooked I thought for sure it was what blew, but it still measured spot on 680 ohms. I think I had inspected the other DSP 5000 sister and it is still sparkling (i.e. no signs of heat damage). So my comments of the newest DSP 5000's likely not needing the resister upgrade/replacement was wrong, they do. Even if they look good, at this point I'd replace them. Still don't understand why 18bit DSP's don't have the issue with both resistors being the low watt style. Edited by Fiddler; 2019-03-26 00:00. In my case, with my M60’s, the positive and negative rail LDO’s had different internal impedances. 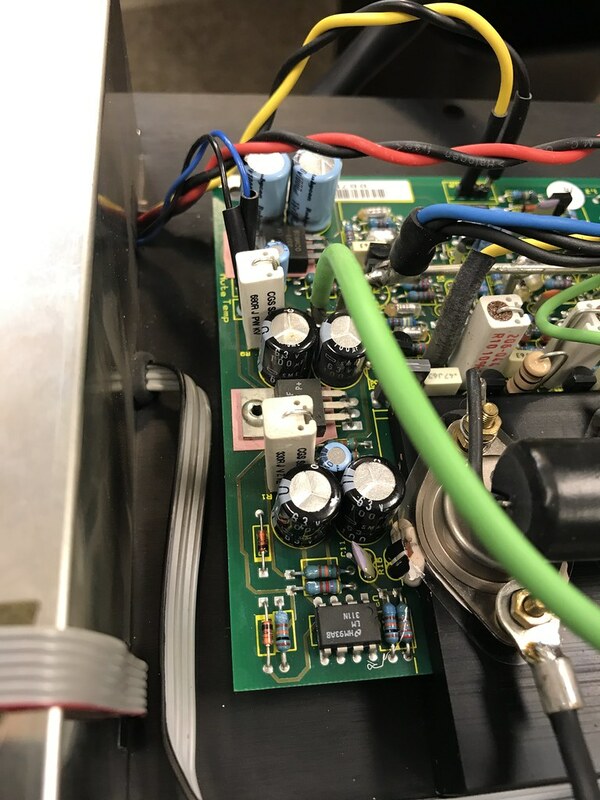 The DSP5000’s seem to use similar amp boards with a seperate DSP input board connected. The amp board seems to vary over the years as running changes were made. On my boards, the LDO’s were from different manufacturers. Either Meridian did not expect the different impedances or they drifted over time, which can happen and needs to be taken into account during design. One of the LDO’s has a lower impedance between Vin and GND and this caused higher current flow across the connected resistors compared to the other voltage rail, and over time, the resistors get crispy. I don’t know why they even have those resistors- seems unnecessary. Maybe to reduce power-on inrush? If anybody knows, please share. I made the decision to match the the “good” power rail LDO current flow. The current and voltage supplied by each LDO to the analog input sections are low, so adding the resistance was not a problem. The resistor and LDO temperatures are now noticeably lower. 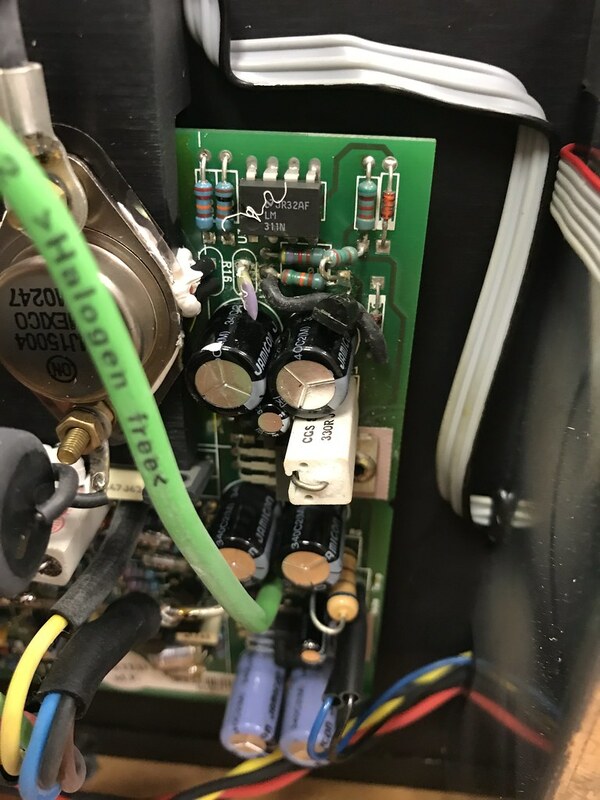 I recommend everyone rebuilding these amps to check the LDOs and replace all electro caps with something like the Panasonic FS series (10k hr caps). A majority of the caps removed tested very far from design capacitance. 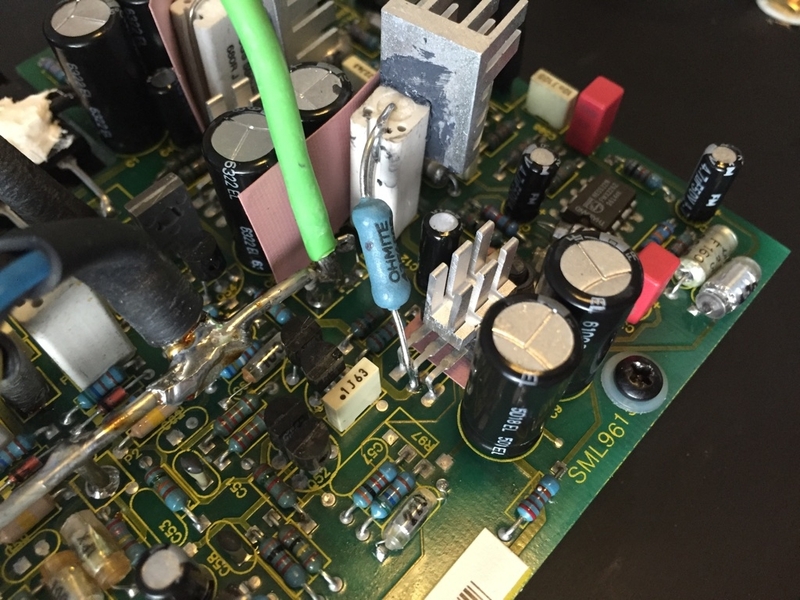 If you hear a ticking sound do not power the speaker until you re-cap the board. The tick is probably a marginally shorting capacitor. Also, don’t over-tighten the toroid transforner mount. It can short the windings. Ask me how I know. I wound up adding some padding between the mount and transformer. The tweeters also die over time. With no input signal you should hear a slight hiss from 2 inches away. If not, the tweeter is dead. Also, crackling sounds are bad (obviously). After replacing the same 3 transistors I had in the past (posted above) I test powered it up and it didn't sound good, lots of noise. Luckily nothing further blew (that I know of), no smell, no blown fuse. There is a row of 4 small glass diodes. In the same area as the blown transistors. Two of the diodes were blown (shorted). One of the two 5.1V Zeners and one of the generic "jelly bean" diodes (I'll get details on that if needed). When I hooked them up the 7-segment displays just constantly flash every LED. I was not sure if there were more problems or just not compatible and need to test with a Smiley Display. I then tried my 2nd Smiley back in the same 18 bit/7-segment cabinet which I know is working and it did the same thing. One other difference is these old 18bit are 220V UK Speakers with a step up transformer I use externally. I have mixed and matched 18bit, 24 bit 7-Segment and Smiley in every combination you can imagine, as well as 240V vs 120V Power Supplies and never had any trouble. Am I just forgetting something? Is the cable different or something. I think the repair is good, but I'd like to confirm before bringing them back north. And I prefer not rip apart yet another smiley to verify. I vaguely recall this blinking issue, like if it's plugged in backwards or off by 1 pin. But I triple checked. Red stripe to red stripe. One thought is when I tested earlier with the blown diodes maybe I damaged the power supply. Wasn't the speaker firmware different for 7 segment and later dot matrix models? Could that be it? The firmware is different between the 7-segment and the dot-matrix displays (as on the smileys) and would cause the issues you describe. Flash them with the latest 7-segment firmware and all should be fine when connected to 7-segment displays. I just logged on to report that. I forgot about firmware. Thanks. Generated in 0.051 seconds in which 0.005 seconds were spent on a total of 15 queries. Zlib compression disabled.